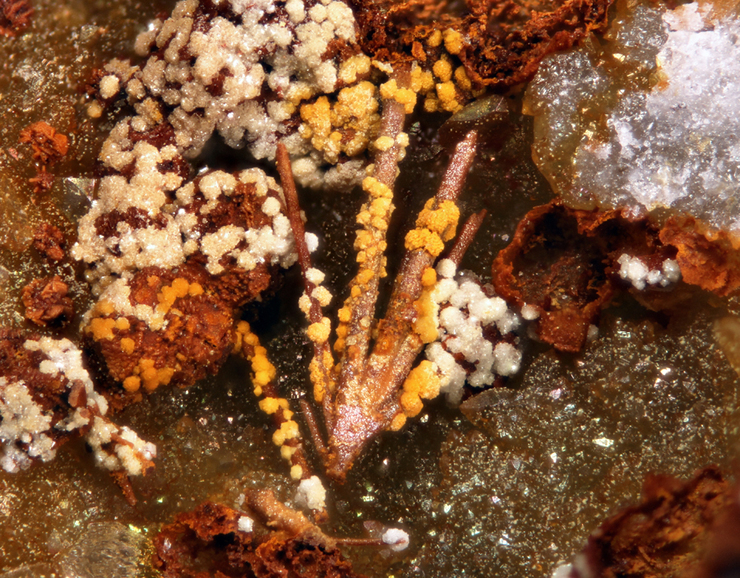 Bismoclite: Mineral information, data and localities. In allusion to the ions it is apparently composed of: BISMuth, Oxide and ChLoride. In contrast to many bismuth oxycompounds, this mineral does not contain the typical bismuthyl cation (BiO)+. May be confused with the Bi carbonates bismutite, beyerite and others. Crystals minute, scaly or thin rectangular, rarely with corners truncated at 45°; often columnar-fibrous, earthy, compact or massive. Quartz 4 photos of Bismoclite associated with Quartz on mindat.org. Bismuth 3 photos of Bismoclite associated with Bismuth on mindat.org. Bismutite 3 photos of Bismoclite associated with Bismutite on mindat.org. Bismuthinite 2 photos of Bismoclite associated with Bismuthinite on mindat.org. Bismite 2 photos of Bismoclite associated with Bismite on mindat.org. Beyerite 2 photos of Bismoclite associated with Beyerite on mindat.org. Bertrandite 2 photos of Bismoclite associated with Bertrandite on mindat.org. Baryte 1 photo of Bismoclite associated with Baryte on mindat.org. Pharmacosiderite 1 photo of Bismoclite associated with Pharmacosiderite on mindat.org. Gold 1 photo of Bismoclite associated with Gold on mindat.org. Totally soluble in acids. Re-precipitates upon considerable dilution. Means (1916) American Journal of Science: 41: 125 (as Daubréeite ?). Larsen, E.S. (1921) The Microscopic Determination of the Nonopaque Minerals, First edition, USGS Bulletin 679: 66. Bannister (1935) Mineralogical Magazine: 24: 49. Mountain (1935) Mineralogical Magazine: 24: 59. American Mineralogist (1935), 20, 813. Mountain, E. D. (1937): Two new bismuth minerals from South Africa. Mineralogical Magazine 24, 59-64. Frondel, C. (1943) American Mineralogist: 28: 526. Palache, Charles, Harry Berman & Clifford Frondel (1951), The System of Mineralogy of James Dwight Dana and Edward Salisbury Dana Yale University 1837-1892, Volume II: Halides, Nitrates, Borates, Carbonates, Sulfates, Phosphates, Arsenates, Tungstates, Molybdates, Etc. John Wiley and Sons, Inc., New York, 7th edition, revised and enlarged: 60-62. Keramidas, K. G., Voutsas, G. P. and Rentzepris, P. I. (1993): The crystal structure of BiOCl. Zeitschrift für Kristallographie 205, 35-40. Anthony, J. W. et al. (1997): Handbook of Mineralogy, Vol. 3, 61. Palache, C., Berman, H., & Frondel, C. (1951), The System of Mineralogy of James Dwight Dana and Edward Salisbury Dana, Yale University 1837-1892, Volume II: 1093. Frondel, C. (1928) New Data on Agricolite, Bismoclite, Koechlinite and the Bismuth Arsenates, American Mineralogist, Vol.28, Nos.9 and 10, pp 536-540. Rankin, J., Sharpe, J.L., Williams, P.A. (2008) Mineralogical note: Waylandite from Elsmore, New South Wales. Australian Journal of Mineralogy, 14:2, 79-80. Rankin, J., Lawrence, L.J., Sharpe, J.L., Williams, P.A. (2002) Rare secondary bismuth, tungsten and molybdenum minerals from Elsmore, New England district of New South Wales. Australian Journal of Mineralogy, 8:1, 55-60. Birch, W.D., Grey, I.E., Mills, S.J., Bougerol, C., Pring, A., Ansermet, S. (2007) Pittongite, a new secondary tungstate from Pittong, Victoria, Australia. Canadian Mineralogist, 45, 857-864. Grguric, B.A., Madsen, I.C. 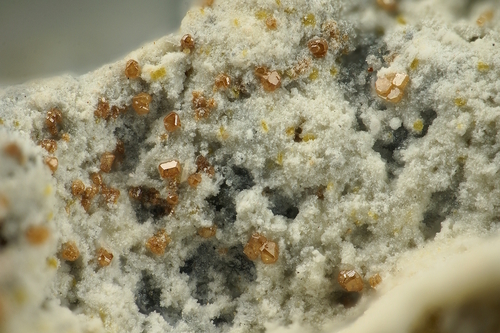 (2002) Bismoclite from the Leinster area, Western Australia. Australian Journal of Mineralogy, Vol. 8, No. 2, pg. 83-85. Färber, G. & Witzke, T. (2011): Exotische Pseudomorphosen aus Brasilien: Waylandit nach Wismutglanz. Lapis 36 (5), 42-43. 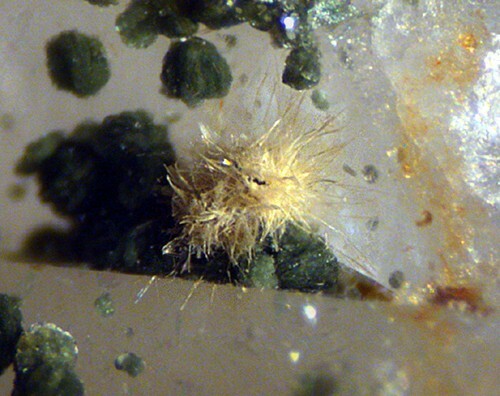 A. Bhaskara Rao and M. S. Adusumilli (1965): Bismoclite from Brazil. Can. Mineral. 8, 390-391. Re-entry of old data; Färber, G. & Witzke, T. (2011): Exotische Pseudomorphosen aus Brasilien: Waylandit nach Wismutglanz. Lapis 36 (5), 42-43. Li, C. & Naldrett, A.J. (1993) Platinum-group minerals from the Deep Copper zone of the Strathcona deposit, Sudbury, Ontario. Canadian Mineralogist: 31: 31-44. Orlandi, P., Demartin, F., Pasero, M., Leveret,P., William, P.A., Hibbs,D.E., (2011), Gelosaite BiMo6+(2–5x)Mo5+6xO7(OH)·H2O (0 ≤ x ≤ 0.4), a new mineral from Su Senargiu (CA), Sardinia, Italy, and a second occurrence from Kingsgate, New England, Australia. Am. Min. : 96: 268 - 273. ; Orlandi P., Gelosa M., Bonacina E., Caboni F., Mamberti M., Tanca G.A., Vinci A. (2015): Sette nuove specie mineralogiche della Sardegna. I minerali della mineralizzazione a molibdeno e bismuto di Su Seinargiu (CA). Riv. Mineral. Ital., 39, 2, 84-115. Ii & Hori (1992) Koubutsu-Gakkai Kou'en-Youshi, 159. Allibone, A.H., MacKenzie, D., Turnbull, R., Tulloch, A., Craw, D. (2016) Polymetallic mineralisation associated with carboniferous I-type granitoids in central Stewart Island New Zealand, New Zealand Journal of Geology and Geophysics, 59:3, 436-456. Zelenski, M. & Bortnikova, S. (2005): Sublimate speciation at Mutnovsky volcano, Kamchatka. European Journal of Mineralogy, 17, 107-118. Gevers, T. W.; Partridge, F. C.; Joubert, G. K. (1937): The pegmatite area south of the Orange River, Namaqualand. Mem. Geol. Survey, S. Africa, No. 31, 172 pp. Mineralogical Magazine (1935): 24: 59-62; Palache, C., Berman, H., & Frondel, C. (1951), The System of Mineralogy of James Dwight Dana and Edward Salisbury Dana, Yale University 1837-1892, Volume II: 61. Lur'ye, L. M., Shadlun, T. N., Ugaste, Y. A., & Vyal'sov, L. N. (1971). Lead, silver, and copper sulfobismuthite from the benjaminite-pavonite group in Kaptarkhan ore deposit, East Karamazar, Central Asia. International Geology Review, 13(11), 1628-1642. Adams, Paul (2010) The Brown Monster and Reward Mines Inyo County, California. Mineralogical Record 41:175-193. Palache, C., Berman, H., & Frondel, C. (1951), The System of Mineralogy of James Dwight Dana and Edward Salisbury Dana, Yale University 1837-1892, Volume II: 62.